Everyone has a part to play in minimising waste and promoting recycling. Apart from recycling at home, you can easily start a paper recycling project in your office, community, church, club or school. The first step is to identify a Sappi ReFibre recycling agent in your area (find a list of agents below). You can also contact the regional manager in your area for help and advice. Sappi paper waste recycling bins are available from our regional offices, and can be placed near photocopiers, in resource libraries or in mail rooms. Clearly display a list of paper types that can be recycled close to the bin. The amount of waste paper generated in your office will determine how frequently you can have the paper collected. Due to the costs associated with transportation, some agents will only collect from your office once you have sufficient paper to fill a bakkie (small utility vehicle). Until then, paper waste recycling bins can be used to store recyclable paper in a suitably dry store room, basement or garage. Alternatively, you may also choose to deliver recyclable paper to your nearest recycling facility. Usually this task can easily be worked into standard delivery schedules to save on costs. If you are considering starting a recycling project in your community, church, club or school, you will need to follow a similar process. It is important to identify whether there is a Sappi waste paper agent or depot in your area, and whether there is a safe, dry place where the paper can be collected and stored. You will also need to find out whether you can have the paper collected by the agent or whether you will need to take it to a depot. In the latter case, you will need to ensure that you have suitable transportation. As with office recycling projects, Sappi paper waste recycling bins are available from our regional offices, and are a handy, eye-catching way to encourage paper recycling. The average household can save 1,100kg of carbon dioxide a year by recycling half of the waste it generates. 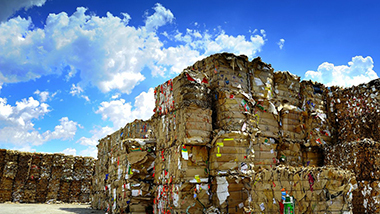 Sappi ReFibre has developed a business model that enables us to recycle large volumes of paper that also benefit businesses and communities as part of the process. ‘Reduce, reuse and recycle’ is a phrase that has become a sustainability mantra all over the world. Few people routinely recycle partly because of the effort involved and partly because they don’t know how to recycle.